. 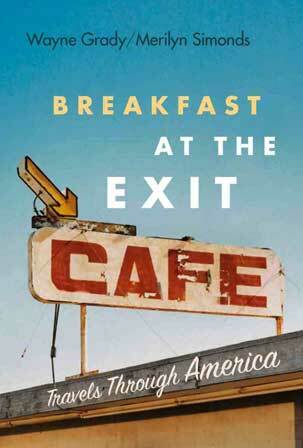 Breakfast at the Exit Café | Excerpt . The highway is twelve lanes wide now, and we can hardly see the earth for houses. We certainly can’t see the matchless harborage: skyscrapers block the view. Wayne counts twelve building cranes rising above the downtown highrises. The rain pours down. The traffic is going nowhere. Clouds settle like tired sasquatches onto office tower roofs. We ease off the interstate and down past small, cottage-like houses pressed into the hillsides. I watch for the sign that says, E n t e r i n g t h e R e p u b l i c o f F r e m o n t , t h e Ce n t e r o f t h e U n i v e r s e , s e t y o u r w a t c h b a c k f i v e m i n u t e s . Or the one that advises, E n t e r i n g t h e R e p u b l i c o f F r e m o n t , t h e Ce n t e r o f t h e U n i v e r s e , s e t y o u r w a t c h f o r w a r d f i v e m i n u t e s .
“Maybe somebody stole them,” Wayne suggests. He seems to like the idea. “Or maybe they disappeared into the temporal shift when everyone changed their watches.” He likes that idea even better. The canyon follows a fault line where two vast chunks of North America came together (Niagara Falls is on another). The silt-laden Colorado River cut down through the fault like sandpaper through balsawood. Each layers on the canyon walls represents the bottom of an ancient ocean; when there was no ocean, and therefore no accumulation of sediment, there is no rock. This absence of rock is called a nonconformity. We are living in a nonconformity now, since the top of the canyon is a limestone slab that is already 230 million years old and has nothing on it but a tsunami of tourists with their requisite hotels and restaurant. Once we have taken in what is there—the pale earthtones, pinks, greys, and siennas of the various strata; the play of light and shadow on the ledges; the trees gripping sheer rock faces with their gnarled roots; the distant specks that are birds (gulls? peregrines? condors?) riding thermals above the river—we slowly begin to appreciate what isn't there. There is far more absent from the Grand Canyon than there is present. In fact, the Grand Canyon is one colossal absence, billions of cubic metres of sedimentary rock carved away almost overnight by that thin silvery trickle of water we see enlivening the canyon floor. From our vantage point on the parapet, it doesn’t look like there’s much grinding and clacking going on. We walk along for a while, hardly taking our eyes off the canyon, watching the pinks turn to purples and the greys to black. Snow is still falling, but gently, as though someone has upended a great scenic snowglobe of the Grand Canyon and then righted it again. Eventually we come to an impressive, four-storey log structure with wings stretching out almost to the canyon's rim. Through a row of lighted windows in the main building we see white-shirted waiters setting up tables in a huge dining room; through another window, an enormous Christmas tree soars to the top of an atrium. People wearing expensive sweaters sit casually about in the lobby, reading, talking quietly amongst themselves, sipping drinks. We have come to the El Tovar. The Double Eagle Restaurant is in an old colonial house, each of its rooms now a private dining area for a family or group of friends. Michael finds us a table in the courtyard by the fountain; it’s not cleared yet so he suggests we wait in the bar, a pillared and mirrored affair that the bartender tells us once graced the luxurious Drake Hotel in Chicago, where Joe DiMaggio and Marilyn Monroe carved their initials into one of the hotel's ornate well-polished bars, unfortunately not this one. Above us hang chandeliers as long as a tall Texan, a thousand hand-carved crystals refracting the light. To Wayne's amazement, Michael makes him a proper Bloody Caesar, complete with clamato juice and a slug of beef bouillon. Wayne is in tippler's heaven. “This is the first time I've ever met anyone outside Canada who knows what a Bloody Caesar is,” he says happily, “and even at home, they don’t use beef buillion any more.” He sighs with the wonder of it all. But Wayne's eye is wandering along the tequila bottles. “Is that Reposado?” he says. If we had been offered a hundred places to spend New Year's Eve, this is the one we would have chosen, this old adobe house fitted with midwestern elegance, a fountain splashing in the courtyard beside our small table in Little Tableland, luminarios lighting our way in the starlit desert night, a place we've stumbled into not by design, not by good planning, but by accident. “To luck,” Wayne says, raising his pony of golden Spanish liquor. I raise my glass of sparkling Perrier. The self-possessed tree still stands in Athens on a small patch of tended turf at the corner of Finley and Dearing streets. It is, in fact, not the original tree that owned itself, since that tree was struck by lightning on October 7, 1942, and burned to the ground. This tree, grown from an acorn produced by the old tree, was replanted by the Junior Ladies’ Garden Club the following spring. It is known as the son of the tree that owned itself. Merilyn and I stand side by side, looking at the tree, our shoulders touching. Protected from traffic, vandalism and dogs by a low, looping, chain fence, it is indeed a fine specimen. White oak is a handsome tree. But I can’t help thinking that, in a state where thousands of black slaves did not legally own their own children, here was a white oak that owned a prime parcel of Georgia real estate. At a time when thousands of human beings were the property of a handful of white masters, here was a tree that owned itself. “Let's get out of here,” I say to Merilyn.